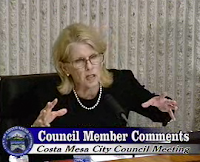 Tonight the Costa Mesa Planning Commission will address a couple interesting issues. First, they will consider a complete ban of "commercial mascots", including those obnoxious "sign spinners" who annoy and distract drivers as they try to attract buyers to their locations. This might make for an interesting discussion. Previously, such bans had been viewed as perhaps infringing on first amendment rights, but several other Orange County cities have recently passed ordinances either completely banning such signs or significantly limiting their use. Then former mayor, current Daily Pilot columnist and current Orange County Transportation Board President, Peter Buffa, will shill for the property owners at the location of councilman Gary Monahan's restaurant (Skosh Monahan's) for permission to allow live entertainment consisting of singers with acoustic guitars and a karaoke machine. What's next - Michael Flatley and his Irish dancers? Buffa is no stranger to Skosh Monahan's. He narrated at least one of Gary's cable television commercials in recent years. Speaking of the Planning Commission, Mayor Pro Tem Wendy Leece wrote a long, self-serving commentary in the Daily Pilot Sunday, HERE, and former council candidate Chris McEvoy wrote a piece condemning Planning Commission Chairman Jim Righeimer, HERE. I find myself wondering if Riggy and his band of merry compatriots will mention the summary rejection they received by the City Council at last week's meeting.